Cambria Suites has been ranked #1 on Trip Advisor for 3 years running and was award the Choice Platinum Award in 2014, along with the Choice Gold Hotel Award for 2012 & 2013 for our outstanding customer service and guest loyalty scores. Our open and airy lobby is the ideal gathering place to unwind. Relax and unwind in our spacious suites which offer microwaves & refrigerators and complimentary WIFI, perfect for the business traveler or families on the go. Indulge your taste buds at Reflect Restaurant and Lounge offering fun, fresh and familiar menu options. Refresh, in our spa-like state of the art fitness center, heated pool and Jacuzzi spa. Planning a corporate meeting or need a block or rooms for your next event? 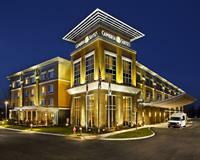 The Cambria Suites offers 2,500 sq. feet of flexible meeting space with full banquet services on site. Treat your guests to award winning service they deserve; adjacent to Hamilton Town Center & Klisph Music Center. We look forward to welcoming you & your travelers and earning your business. Located just off I69 at Exit 210.